Once again it’s Monday, the first Monday in autumn, and time for In a Vase on Monday, hosted by Cathy at Rambling in the Garden, I have been growing Cleyera japonica for over ten years and found it to be a reliable, vigorous (always be careful of a plant described as “vigorous”), and evergreen. I have seen almost invisible flowers on them, but this is the first year I’ve seen these lovely, red seed pods. Perhaps they were there and I just didn’t notice. Whatever. This week’s vase consists entirely of the seed pods. Let me invite you to visit our host Cathy at Rambling in the Garden, to see what she and others who participate in this meme are displaying in their vases this week. This entry was posted in Gardening, In a Vase on Monday and tagged Cleyera japonica, Rambling in the Garden. Bookmark the permalink. Nice, waxy green foliage, the fruit are a bonus. Sounds like a solid landscape plant! Thank you, Eliza. It is a solid plant but it needs to be positioned with the understanding that it can get really, really big. It’s always lovely to have something that captures the essence of the season. Beautiful! Thanks, Marian. I also like surprises and these berries were indeed a surprise. Actually, I should have said…insignificant. Alas, another senior moment. 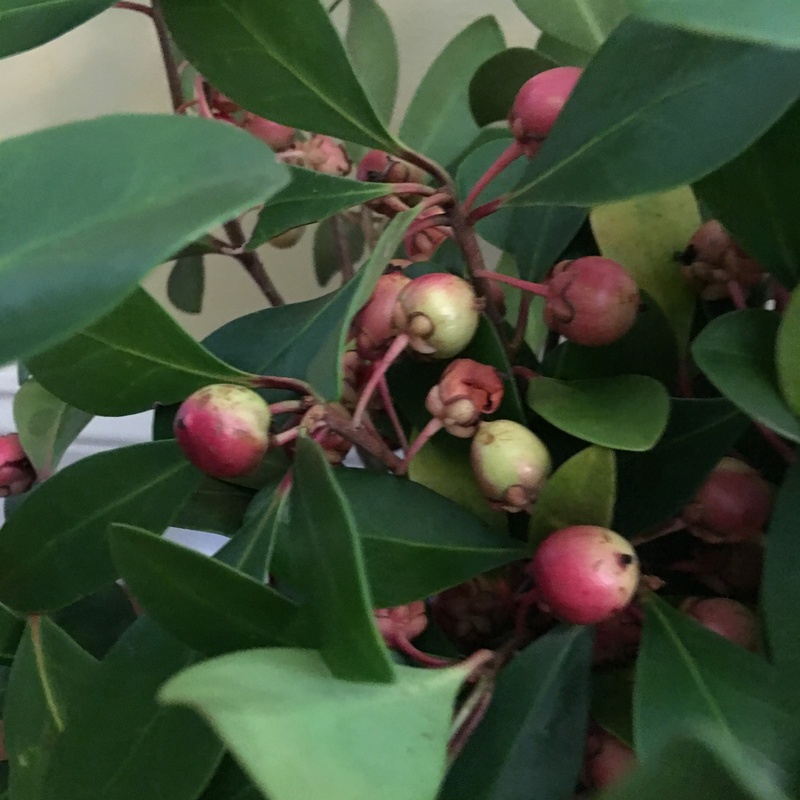 I am unfamiliar with this plant but I love the leaves and those seedpods are divine….makes a dramatic statement in a vase. Thank you, Donna. Isn’t it fun to learn about new plants? I love Cleyera, wonderful display. I didn’t know about it until this garden. It has served a good purpose, but one of them was planted in a bed…gets way too big and now almost impossible to dig out without a bobcat. So a lot of pruning on it. There is always tree form! I just transitioned some of my gigantic shrubs into small trees. They look like little apples. I hadn’t thought about it, but you are right. Thank you, Christina. The red seed pods are indeed lovely. They look like little apples. Thanks, Jason. See above…Christina’s comment. Ah, so I wasn’t the first to have that reaction. Very nice choice for a vase. I wonder if it will still be in good shape for the winter holidays. 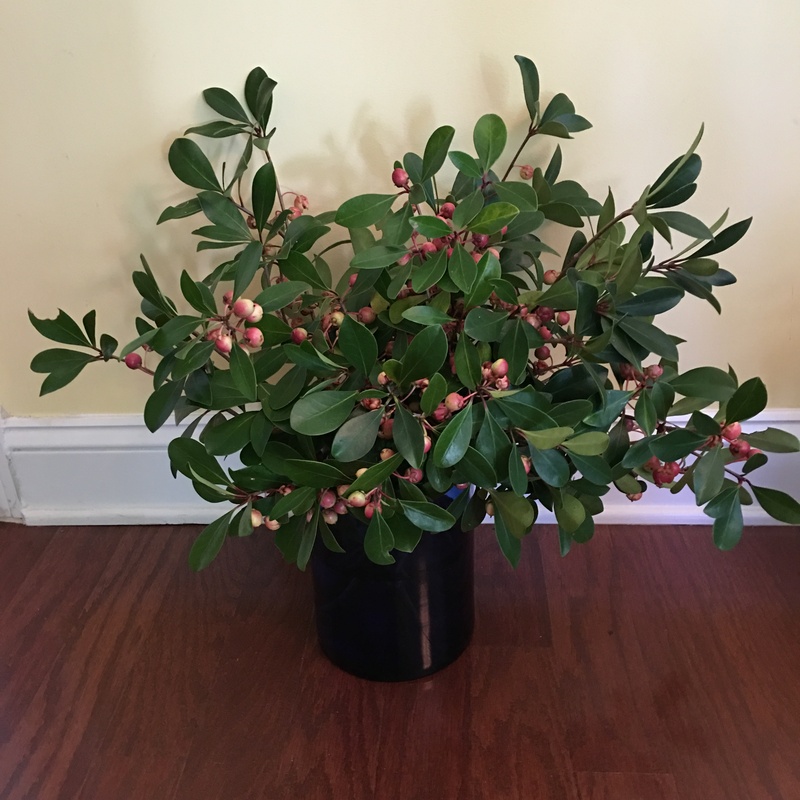 With the perfect evergreen leaves and a little more red to the fruits it might be ideal for the season! Thanks. I don’t think they will last till the holidays. They are already opening to drop seeds and losing a lot of the red. Alas.